NASA’s Manned Space Program; Dieing slowly? The other day I had one of our first year graduate students ask me what I know about NASA. “I know some people on some of the science missions,” I said, and I asked him why he was asking. Truth be told, he, like so many other bright, athletic minds, wants to be an astronaut. At 22, with a number of nice accomplishments under his belt, he just might have a chance. He’s young enough. By the time he ‘s ready NASA may have manned space flight again. As for the dreamers of my generation? We’re pretty much… Well you know what word goes there. According to NASA, the average age of someone accepted into the astronaut core is 34 (my age). It then typically takes a few months to a year to be selected for a mission (if you ever are selected), and then another half year or longer to train for a mission. My guess would be that someone hired in the current round (and NASA is currently hiring astronauts) would get their first opportunity to fly in late 2011 or so. Except I don’t think we’ll have a manned government funded space program at that point in time. And it scares me how little people are aware of this. 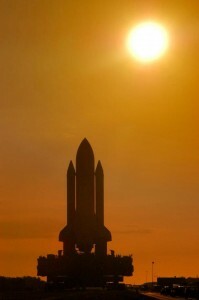 The last space shuttle launch is currently scheduled for May 2010. The Shuttle fleet needs to be retired. While the shuttles still work (mostly) they were only meant to last until 2000, and it is increasingly difficult to keep them running (NASA buys parts on eBay periodically). There are also only so many resources to go around. We can’t pay the salaries of the folks who service and run the shuttle fleet and pay people to design and create whatever comes next. The original plan was to use Russian capsules to launch astronauts to the International Space Station after the shuttle fleet was retired. For that to happen, Congress needs to invest in the Russian Space Agency *now* and send them money *now* to pre-order capsules that take three years to build. Due to the latest Russian actions in Georgia, Congress is justifiable reticent to invest capital in that country. While there are plans to continue the Space Shuttle to fill possible gaps… At some point the shuttle will die – some vehicle will suffer one too many technical problems, and like the old pickup you give up on, it will be sent out to rot in the back pasture (or at least at the Smithsonian). Hopefully it will fail with no one in it. Once this happens, my guess is the whole fleet will be grounded. The new program to build launch vehicles, Constellation, is seriously delayed. According to official NASA pages, Orion (the manned half of the Orion program) will have it’s first launch in 2014. Unofficially, it is facing all sorts of delays and cost overruns (1, 2). And if Obama is elected, he’s announced he’ll delay the mission 5 years. My guess – Constellation will launch 2019 at the earliest, and more likely 2022ish. Getting the Constellation program going is far harder than anyone seems to have previously anticipated. This is going to be a rocket that makes the Saturn V look average. To get it to work, everything has to be rebuilt, from beneath the ground on up. Literally. The Crawler may not be able to support the Ares rockets’ weights and the Launch Pad will need to be restructured for this taller rocket. These are rebuilds not fully budgeted. I have to admit that I’m afraid that if the cost overruns for the Constellation program become too great, it will simply be canceled. This has happened before (e.g. the X-33 and see also). Needless to say, as I look at the facts as I can google them, I’m not going to apply for the Astronaut core (actually I wouldn’t anyways – I enjoy teaching too much). And, I’m going to encourage students interested in the astronaut core to get to know the non-NASA space cores. As we move into the future, I’m hoping that the commercial space agencies may somehow find a place in space doing science now and then. Just as I fear NASA is about to enter a period without a manned space program, I also think that thanks to Scaled Composites (who will bring us Virgin Galactic) and Bigelow Aerospace commercial space flight is going to become what Concorde flights were in the early 1980s: expensive but possible for anyone who wins the lotto or makes a killing on the stock market. I hate giving advice that tempers dreams. I hate that NASA is breaking my heart all for lack of funding. This blog is not showing up in Google on the first page of searches for my name or Star Stryder or starstryder. I have no idea what’s going on. If anyone has any ideas, can you please email me? pamela at starstryder dot com. I think I just saw your old Star Stryder on SIUE. Funny, your pages aren’t in Google’s cache. Here’s an idea: Go to “google (dot) com (slash) webmasters” and try to analyze your site status to see what Google spider’s are saying about your site. Perhaps Google deleted because of an error, problem with robots.txt, or falsely classified as spam. I think the Google Webmasters tool might clarify things a bit. I’d like to note because I hate seeing this still spreading around that Obama has recanted his position on delaying constellation. I know it used to be in on google. Most likely it got removed form the index accidently or by request. Atleast your twitter page is on top … could be worse. I think your comments about Obama’s policy are out of date. Well I’ve nearly exhausted every way to contact you now. I strongly suspect that the huge list of spam related words at the bottom of your HTML (try to view source) are the reason for your drop in the Google rankings. Google will see those and think you are a spam site. The div tag they are in is absolutely positioned so you wouldn’t see it. I haven’t a clue why the list of spam words are there though. Could be that someone has hacked your WordPress installation or your site. Okay, I’ve determined starstryder got hacked. UGH! Working to fix it. So no happy right now. Sadly, I think we’ll be stuck on this little blue marble for eons to come. Oh well. Go to Yosemite or someplace and realize the world is still pretty big. who in their right mind will hack good ol starstryder? …..and oh yeah Damn Nasa and the congress for taking our dreams away, hope Mr Obama means what he says about – “.. they have rejected science. I want to reverse that trend, I want us to be a science-based society and I want us to invest in science.â€šÃ„Ã¹– it sounds something that was said in the ’70’s. sad how in any society, once anything goes out of whack, its always the intellectuals and the scientists that get blamed ( well next to the politicians hehe).